This article was updated on March 12th, 2019. What is FBAR filing and who needs to report it? And the aggregate value of those accounts exceeds $10,000 at any time during the calendar year. How does a U.S. expat report FBAR on FinCEN Form 114? On FinCEN Form 114, a taxpayer needs to report foreign financial assets according to the certain requirements. They include but not limited to bank, securities, and financial instruments accounts; mutual funds and you, as the account holder, have an equity interest in the fund; brokerage account, trust, and insurance policies or annuity contracts with a cash value etc. Filing an FBAR is required if the total (aggregate) value of all of your financial assets is over $10,000 on any day in the tax year. It is can be a quite confusing situation for taxpayers who they aren’t the main holder of a financial account. Americans abroad mistakingly think they don’t need to disclose the foreign account on FBAR in this case. Well, you need to know that even the nominee must still file the form if the threshold was met. Example: A U.S. person abroad has 2 different overseas financial accounts. He has $3,400 in one and $6,600 in another, he must report both accounts on Form 114. What you do not need to claim on the FBAR: domestic mutual funds that invest in foreign stocks; regulated financial accounts, i.e. TFSA and RESP in Canada or Livret A in France and personal property that you held directly. 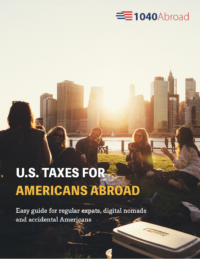 Americans in Canada, check out this blog post about tax traps for you. How does an American overseas file an FBAR? This year’s deadline for FBAR is April 15th, 2019. If you failed to fail an FBAR by that date, don’t panic! FinCEN has granted everyone an automatic extension to October 15th, 2019. Hurry up and sort out your Foreign Bank Account Report before last due date! The FBAR is filed electronically through FinCEN’s BSA E-Filing System and it’s filed separately from a federal tax return. And none of you or only one has a separate account. Otherwise, each spouse must file their own FBAR. A taxpayer who holds a foreign financial account can still meet the reporting obligation. Even when it doesn’t produce taxable income! It happens by answering questions on a tax return about foreign accounts (Schedule B Form 1040). And additionally you need to file an FBAR too. Are you a U.S. citizen living in the United Kingdom? Check out this article about tax obligations for Americans in the UK! Are there any FBAR penalties for failing to report? Under the current FBAR rules, If you non-willfully fail to report FBAR, there is a penalty of up to $10,000. Wilful violations lead to the penalty up to $100,000, or 50% of account balances. Criminal penalties may also apply. Over the last decade after introducing the FBAR penalties, the filings have skyrocketed from 280,000 FBAR in 2005 to 1 million in 2015. The IRS hasn’t contacted you about the delinquent FBARs. You will need to file late FBAR on FinCEN website and include a statement why you are filing the FBARs late. What is Form 8938 and do I need to file it? It’s a separate form, which doesn’t replace nor affect your U.S. expat’s obligation to file FinCEN Form 114. You need to check the requirements and relevant reporting thresholds of each form to determine if you need to file Form 8938, Statement of Specified Foreign Financial Assets. OR assets exceed more than $600,000 at any time during the year. You need to file and attach Form 8938 to your annual federal tax return and due on the date of latter, including applicable extensions. The penalty for Form 8938 is up to $10,000. And then an additional $10,000 for every 30 days after an IRS notice/letter. The potential maximum penalty is $60,000 and criminal penalties may also apply. What does FATCA have to do with FBAR? FATCA, or the Foreign Account Tax Compliance Act, is different from FBAR. Form 8938 is a part of FATCA laws and it’s filed with your federal tax return and submitted to the IRS. You file an FBAR with the US Treasury Department, and the threshold is much lower. Remember, it’s $10,000 for FBAR filing vs. min $200,000 needed for Form 8938. You are most likely not be affected by FATCA unless you have at least $200,000 as an interest in foreign financial assets. According to the IRS, having an interested in an account or assets means “if any income, gains, losses, deductions, credits, gross proceeds, or distributions from holding or disposing of the account or asset are or would be required to be reported, included, or otherwise reflected on your income tax return”. If you need help with your FBAR filing, contact us today and we will get back to you within 24 hours. We earned $1538.08 in interest in the year 2017. Do we have to file FBAR? we replied your inquiry via personal email. For everyone else wondering if they have to file FBAR in a similar case – everyone needs to file FBAR if they have foreign financial accounts with an aggregate value of $10,000 or more. I live in Germany and have filed my FBAR every year (ca 20yrs) for 2 accounts we have. This year I´ve tried 3x to fill out the forms and am not able to enter the “Type of Account” or the Country. The forms want a State and there is no option for a foreign country. I have printed my forms and entered the Type of Account and country manually. Now I would like to mail them in, but can´t find an address. I am a US expat and live in Canada. I have filed my FBAR’s for a number of years. This year I filed on May 11th. After looking over my accounts I found that I had inadvertently added an extra zero on one of my accounts after I had already filed. I also see that I have filed late. I had assumed it was Jun 30th like last year. Should I refile and can I refile an amended report? We responded you via email. I am dual status tax resident from Oct/2017. Prior to that I was a non resident. What portion of the income from 2017 do I need to report in FATCA and FBAR? Please help me understand the requirement for filing FATCA F8938 for Dual resident taxpayers, as mentioned at below link. I come under below scenario as I am a resident since 10/2017, and wanted to know which portion of the year should I declare my foreign assets. I didn’t include my foreign bank account in my tax report because I earned no interest. I now know I need to do this by FBAR. Should I also need to amend my tax report this year?? We replied to you via email. Thanks! FATCA refers to general no cash assets like primary home purchase or refers to money in the bank? I am a US citizen living in the United Arab Emirates since September 2014. As of June 2018 I have the equivalent of one month’s salary in a savings account here. When my salary was then paid at the end of June, the value of my checking and savings account were equal to two month’s salary which crosses the FBAR threshold. However within a day or two of receiving my salary, after I pay rent and various other expenses, the value of these accounts drops to well below the FBAR limit. Will I still be required to file an FBAR for 2018 by April 15, 2019? Hi there. I am in a panic. I moved to the UK at he end of 2016 and only started working full-time in 2017. I filed my 1040 recently ($31k AGI) for 2016 and I am just now learning about all these tax laws. I just turned 28 and I was married in 2015. I only earn about £24k and have like £600 to myself after bills every month. We don’t have our finances together aside from paying rent together at our small one bed apartment. I am scared I have made a grave mistake and will go to jail or something for not filing properly and I am scared to owe thousands of dollars I don’t have. I am terrified of being separated from my spouse. I have been losing sleep over this and have no idea where to turn! Hi, I have a bank account in China which the amount is under USD10,000, and a retirement governmen funds which over usd10,000 before I moving to United States, Do I need to file FBAR? If yes, how about the procedure and the price? Thank for your help. We replied to you via email. Check your inbox. Thank you! Hi, I am an Indian citizen and I live in US. From January 2018 I have been sending around $1000/month to my father account in India for family maintenance and also I have made some donations to foreign charities. The sum of amounts is now exceeds $10,000. My tax agent suggested me to file FBAR form. But in the online I found that, FBAR is for having more than $10,000 USD in the foreign banks. I don’t even have $100 also in my foreign bank account. So do I have to file FBAR form or Not. We replied to you via email. Check your inbox! I need to file FBAR under the amnesty program by Sept 30, 2018. Can you help me filing? Yes, we can help you with filing FBARs under the amnesty program. We also replied to you via email. Please, check your inbox. Do you think that if you have assets or earnings from such countries then there is no point in declaring them? I’m not looking to evade taxes so to speak but if we can minimize our liabilities it certainly helps our retirement funding. In respect to for 8938, if an account is a non interest bearing, no income/deduction account (so no implications to the tax return), but the value reaches the threshold, does this require reporting? My US-American mother had been living in Germany for the five years before her death. In those years she never had to do FBAR. She died last month and it so happens that she would normally have to do FBAR for 2018. (She exceeded $10K by only a little though, not much). Do I need to do a concluding tax return and FBAR for her? And/or, would the IRS really hound down the executrixes of deceased people for having digressed an FBAR for just a bit for one year? Yes, the executor of the estate would have to file an FBAR. My wife and I live in Switzerland since 1976, and are both U.S. citizens (and also Swiss since 2007). We have submitted our FBARs separately, indicating jointly owned accounts on my FBAR. Are we also required to indicate joint accounts on her FBAR? It’s a very good question! Yes, your wife will have to report all her financial assets she has interest in and indicate which of her financial assets are joint if you file your FBARs separately. I moved to Spain to do my phd and brought my savings ($15,000) to a Spanish bank in order to pay my living spenditures. I have never worked in Spain, and the money is essentially there, not gaining interests nor anything, just being used to pay housing, food and education. 1. Do I still need to file FBAR? If so, I missed the dates as I didn’t knew. I keep reading the delinquent form, but I just find the normal form. 2. Is it the same form? 3. Do I write the statement in the form or is this a separate letter? You need to file since the total value exceeded the $10,000 during the tax year. You should just efile your FBAR even though its late. There is a part that asks for a reason to file if delinquent. One of it is not knowing you had to file. i am green card holder working in Dubai in one private company as Manager and company have given me signature authority in bank. I am not a owner of the company and not owner of money in bank account. Please let me know i will have to file FBAR or not ? Yes, you will have to file an FBAR even though it’s just a signatory account. I’m an American working in the UAE for an American company. My pay is distributed to me with US taxes withheld (per my W-4 information provided to my employer). Do I still need to file a FBAR? Doesn’t the IRS already know what $ amount I’m making here? Hi, I am a US citizen working in Germany for 3 months. My account does not reach $10,000.00 in a single day. My salary this year won’t be close to this amount. Next year I’ll have the full year salary. For the FBAR would I need to fill it out either this year or next year if none of the days my account is over $10k. You need to file FBAR if the value of your foreign bank account was higher than $10,000 at any day during the tax year. For FBAR reporting I am a signatory ( US Citizen) and my husband the other signatory ( Canadian Citizen) so do I report the entire amount in the account as mine? You need to report this account even though you only have a signature authority. But you don’t report them as your accounts, but report them in part IV of FBAR designated for accounts with signature authority. If you have troubles filing your FBAR, we can prepare it for $100. I am an American living in France for more than 30 years (with French nationality as well) and my checking account has never exceeded 10 000 Dollars. I have a Livret A (which according to your info, I do not have to declare). My bank did send me a letter saying they were complying with US authorities and sharing my info with them, but I have understood that I do not need to declare since my account doesn’t exceed 10K$, neither in the past nor at the present time. Am I correct in my understanding? Many thanks. Yes, you are correct. You do not have an FBAR filing obligation until the total value of your foreign financial assets is higher than $10,000 at any time during the calendar year. In the FBAR, in the address it is required to fill in the field for “state”, whereby the menu only lists US states and does not have a choice like “other” or “not applicable”. The form does not go through without filling this in, even though it is nonsense. What to do? If you are residing outside the US, you don’t have to report a state (as the ‘state’ box in form Fincen114 refers to US states only). You just have to report the country where you live, in the box that’s below. In that case, the state box remains blank. Hi! I am a US Citizen living in United States but I have a foreign bank account in Philippines but I just use it for sending money to my family back home. It never had an amount of more than $10,000 dollars. Do i still need to file a report to FBAR? Do I even have to report it to IRS? Also I just open a broker account that is based in Philippines and started investing in Philippines stocks but the total investment i have there is only $2000 so far. Do I still have to report it to IRS? Hoping for your response! thanks! You will need to file FBAR in cases when the total value of your foreign financial assets exceeds $10,000 at any point during the year. Please, check your inbox. Thank you! HI Olivier, do I have to file FBAR if the account was overdrawn (ie the overdraft exceeds $10,000)? There is no need to file an FBAR. Accounts with a negative balance are deemed to have a zero dollar balance. My mother is a landed immigrant in Canada and after buying my fathers pension (greater than $10000)from ford motor company canada. She invested that money to reduce the impact of taxes. She files both US and Canadian Taxes each year including taxable income from the accounts. She’s never filed an fbar or a fatca. She also has not been audited nor contacted by the IRS. What course of action would you recommend to bring her fabric and fatca records up to date without imposing penalties. We replied to you vie email. The FinCEN website was operating normally. FBARs are accepted a few seconds after being filed and they are acknowledged within 48 hours. I have my foreign bank account which has 6000$ whereas my wife has an individual account (it’s not a joint account, she is the sole owner) which has 5000$. Do I have to file FBAR in this case as I’m not the co-owner of my wife’s account? According to info you have provided, you are not required to file FBAR. I am an individual filer attempting to fill out the online FBAR form, but not certain what is meant by a “Prior report BAS Identifier”. Do I have to fill this in? If so what is it and where do I find that information? Actually there several numbers and identification requirements, for eks. US Taxpayer identification Number … is that Social Security?? Feeling a bit clueless here. Hello Olivier, can you also assist with form 1040 queries? We can assist with Form 1040 queries. You can book a paid consultation with our U.S. tax expert: 100 USD for 30-mins or 200 USD for 1 hour. I was wondering what the FBAR reporting obligations are for a year in which US citizenship was renounced. Do accounts opened after the renunciation need to be reported and are they counted towards the threshold for the 8938 filing ? Are maximum account balances considered across the entire year or just until the date of renunciation ? 1) No, you don’t need to report accounts which you opened after the renunciation. 2) Until the date of renounciation. Are you aware of any official IRS guide/publication that supports these points? Also do you happen to have any knowledge of the approach taken by others in the same situation and the response (if any) from the IRS. This year I still have not received the email acknowledgment after filing my FBAR two weeks ago. What should I do? You can log in to the BSA filing system and see the status of the FBAR filing. Hi, It appears that the electronic form FinCen 114 has changed this year and we are required to use the new form for electronic submission. It looks like the new form asks for exactly the same data in exactly the same format as the old form. Is it possible to move data already entered in the old form to the new form? Any idea why the change? Could it be we really have to reenter all that data manually? It looks like you will need to reenter all that data manually. Hello Oliver. I’m a refugee on “asylum pending” C-8 category status in CA, should I file FBAR for my foreign accounts? If yes, how to avoid penalties as I didn’t file it in my first tax last year! Under the substantial presence test, an individual is a resident alien if he/she is present in the United States for 1) at least 31 days in the current year and 2) at least 183 days in the three-year period that includes the current year (counting each day of presence in the current year, one-third of each such day in the preceding year, and one-sixth of each such day in the year before that). Thus, the FBAR filing obligations apply to a person who meets the substantial presence test. If you want us to help with your FBAR filing, please, send an email to info@1040abroad.com and we will start the process. Thanks. 1) Can I file my 1040 and get an automatic extension to file the FBAR until 10/15/19 without filing any sort of extension form? I think there were automatic ext last year but I haven’t seen anything for current tax filing. 2) I have 2 accts in Korea, opened 4/23/18 1 with 2 million Won ($1,799 at 12/31/18) and the other has $84,016 USD. I know nothing else: acct numbers, type of accts. My Korean mother opened them, refuses to give me stmts or info in fear of IRS taking some of it. Seems like I have 2 choices: A) file a best efforts FBAR now and see if you can amend next yr. B) if automatic extension granted. I am going to Korea this yr… doubt with the language barrier and my mother not wanting me access that’ll find out more info. But if I do, I could file a more accurate FBAR by 10/15/19. 3) I think the Korean accts would need to be included in my Form 3520 too even though I don’t actually have access to the funds. And if I’m able to wire out this yr… I wouldn’t report in 3520 twice for 2019 filing right? Would you use the 12/31/18 exchange conversion for the smaller Won acct, to be consistent with the FBAR, or exchange as of 4/23/18, when opened. 4) Mother also wired some funds to wife. If she’s individually under $100k in 2018 gifts, should I report on Form 3520 anyhow, since reporting for me, and do a joint 3520? I think the $100k rule is not aggregate between recipients since they are not for $15k domestic gifts (only by giver). But I think neither the foreign gifts or the foreign accts are taxable anyhow right? Obviously this last min. finding has got us in a panic. Thanks in advance if you can provide any insight! 1) You get an automatic extension for FBAR filing until October 15th, 2019 and until June 17th, 2019 for 1040 Form. You will need to file for extension if you want to submit your 1040 Form in October. 2) If your name is on it, the IRS already has your information. Now, they are just waiting whether you will come forward and report it on your FBARs. The penalties for not reporting these vary from $10,000 to 50% of the account balance. 3) Is it a foreign trust? If yes, then you are required to file 3520. 4) If the money came from the trust, you need to supply your tax return with 3520-A. And in this case, I strongly recommend to file the 3520-A as soon as possible. We have seen the $10,000 penalties being assessed for late filings of the form. I think I might also have to file a form 8938. While married and filing a joint 1040, my 2 Korean accounts are not jointly owned with spouse, and over the $50k limit for individuals/married filing single (for form 8938). If yes, I wouldn’t be able to wait on the FBAR unless I also extended my 1040, since I think 8938 gets filed with 1040. I’m confused on the qualifications for joint filing 8938, but I had assumed that married filing 1040 jointly made me eligible to not file 8938 since below $100k at any time in 2018. 2) OR assets exceed more than $600,000 at any time during the year.